I always keep my eyes peeled for new styles or trends happening around kitchen design because I honestly consider it such an important space in any home. Recently I spotted the kitchen of my dreams when I saw Jenna Lyons flawless Soho loft in T Magazine (you can see the video tour here). As much as I loved her space, I honestly could not get over her brass kitchen. It is so chic yet full of glamour (quite similar to Jenna Lyons I would say). 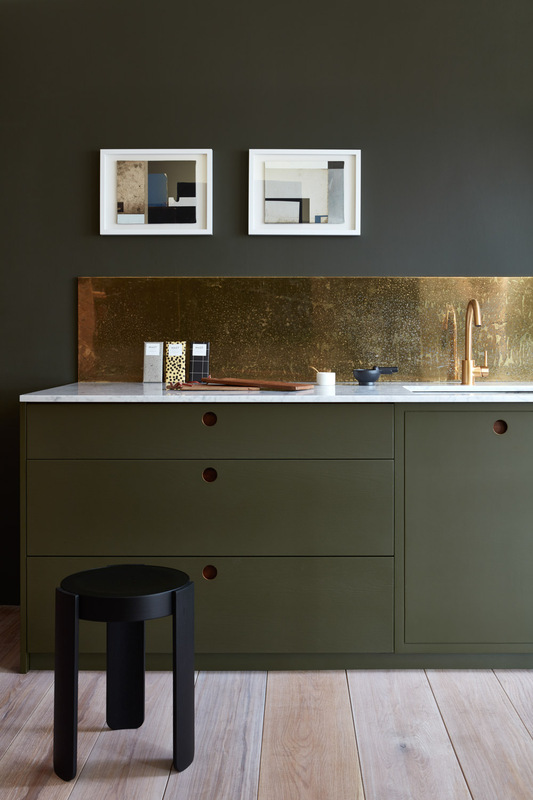 What I like most about this minimal brass design is there is no cabinetry above it. With the gold design being simple, it really lets the eye appreciate the strong metallic accent, especially in a working space like the kitchen. Let’s just say, I have really fallen for this style. I wanted to share today a kitchen inspiration, all of which have used minimal brass back splash within their design. It is surely a style I think we will be seeing more of. Here is another look at Jenna Lyons kitchen. 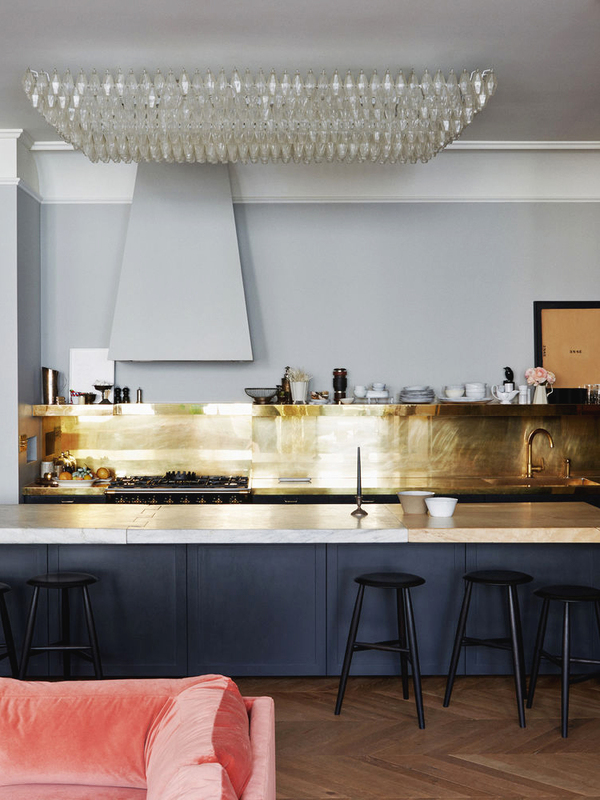 I love the glamorous accents like the chandelier and the brass, combined with more simplified design like the wood panelling below the bar and wooden stools. It is also worth noting the simple one shelf above the brass. This is paid down luxury at its finest. Image via Simon Watson. This is another kitchen that I went crazy over. Designed by Naked Kitchens they combined a minimal brass backsplash with olive green contemporary cabinetry. They also added a brass tap for extra drama. I am a big fan of Naked Kitchens, see more of their designs here. Image via Naked Kitchens. 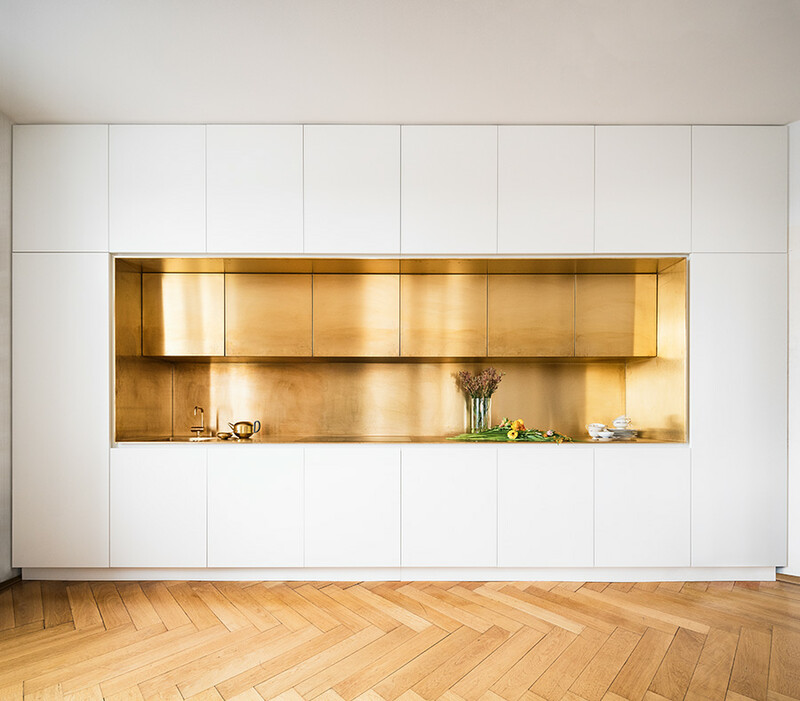 Here is another example of a fantastic minimal brass design, this time paired with modern white cabinetry. Image via Behance. This brass backsplash is actually on the kitchen island but still looks just as dramatic. I like how in this case they kept the brass design minimal not complicating it too much with stools or other decorative objects. 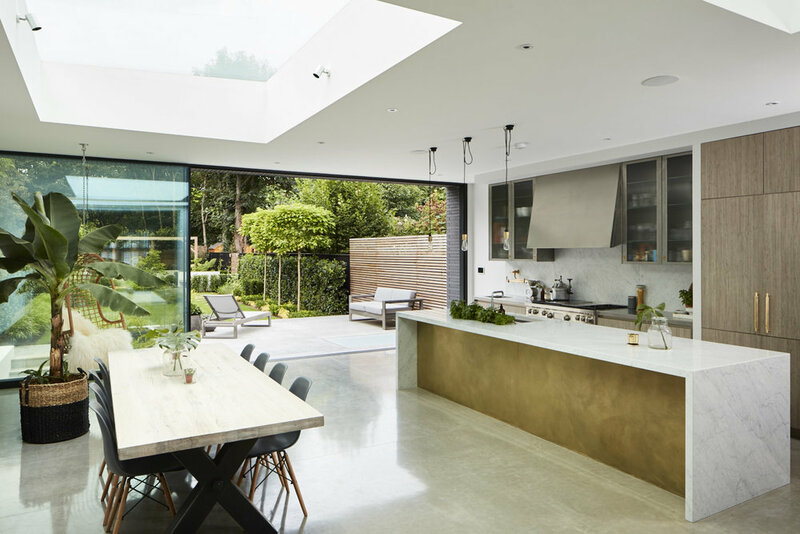 This is the kitchen belonging to House Curious and it is a truly striking space. Image via House Curious. Cover image via Simon Watson.